Bulgur and quinoa are both whole grains that make terrific healthy side dishes. Bulgur is precooked cracked wheat. Because it cooks very quickly, it makes a handy convenience food. 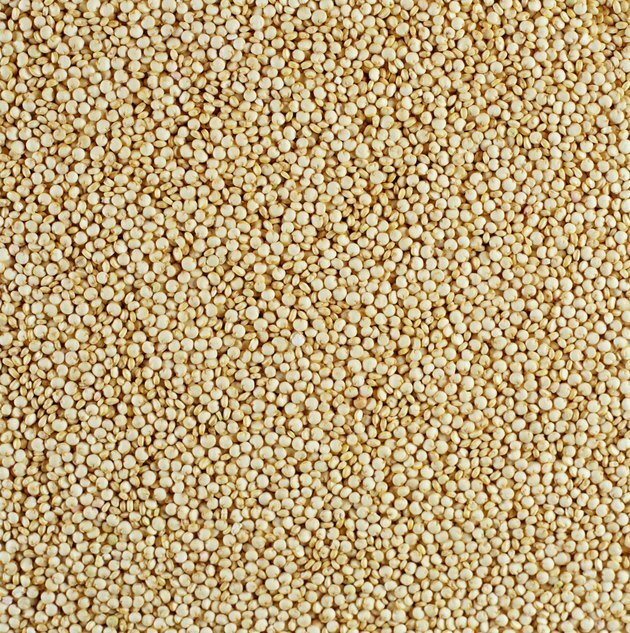 Quinoa, technically a seed, comes from a plant native to the Andes and first cultivated by the Incas. Quinoa is nutritionally denser than bulgur, with more calories and nutrients per serving. Quinoa, with 222 calories per cup of cooked grain, has nearly twice the calories of bulgur, which has 112 calories per cooked cup. Cup for cup, quinoa has more of nearly every macro- and micronutrient except dietary fiber. However, if you eat 2 cups of bulgur, you'll take in approximately the same amount of calories and nutrients as in 1 cup of quinoa, plus 12 grams of dietary fiber, nearly half of the average daily target intake. Quinoa has 5 grams of dietary fiber per 1-cup serving. Bulgur, with its greater volume per calorie, may promote satiety more effectively than quinoa. Quinoa contains 8 grams of protein per cup, about 18 percent of the daily target intake. Bulgur, too, provides valuable amounts of protein, with 4 grams per 1-cup serving. Per calorie, bulgur contains just as much protein as quinoa does. Quinoa is a complete protein -- that is, it contains all nine of the amino acids that humans must get from food. Quinoa is also free of gluten, a protein that causes allergic reactions or digestive problems in susceptible individuals. Bulgur, like all wheat products, contains gluten. Quinoa is rich in copper, magnesium and phosphorus, containing nearly 40 percent of the daily target intake for these minerals. It also contains about 20 percent of the daily value for vitamin B-6, folate, thiamine, riboflavin and zinc. It contributes 15 percent of the daily target for iron. Bulgur offers a similar array of vitamins and minerals in smaller amounts. Calorie for calorie, quinoa is slightly higher in vitamins and minerals, but both foods are valuable sources of micronutrients. Bulgur is the key ingredient in tabbouleh, the classic Middle Eastern salad. To prepare bulgur, cover it with boiling water, let it sit covered for 15 minutes and drain. For tabbouleh, add chopped parsley, tomatoes and onion, lemon juice, olive oil, minced garlic and salt and pepper to cooked bulgur. Quinoa has an appealing nutty flavor. It's delicious in grain salads and topped with gravy or tahini sauce. You can also eat it as a hot breakfast cereal, topped with milk, raisins and nuts and flavored with a bit of cinnamon and honey.